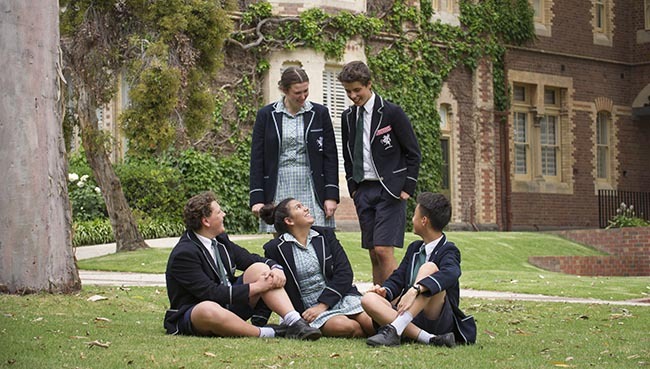 With almost 100 boarders, The Geelong College offers a family-style boarding experience that encourages friendship, independence and academic excellence. Boarding life is rich and fulfilling, combining homework, sport and other co-curricular activities, with time to relax. Each week night, boarders have two hours of study time with specialist academic tutors available to assist them. Students focus on their studies without the distraction of phones or access to social media during study time, which is important for productivity. Geelong College boarders do exceptionally well academically. Our boarding community is diverse and inclusive, with students from country Victoria and New South Wales, the coastal towns and farming areas surrounding Geelong, and from Melbourne, as well as international students from Thailand, Malaysia, Laos, China, Hong Kong and Germany. With such a broad range of people, boarders learn greater understanding and respect of different cultures and backgrounds. The College has two separate boarding houses, just minutes from the school. Mossgiel, the girls’ house, has units where girls from different year levels live together in single or double rooms with shared bathrooms, lounges and kitchenettes. Mackie, the boys’ house, has single rooms with shared bathrooms that look out over the oval. Both boarding houses have informal areas where boarders can watch television, play games, table tennis or billiards, and entertain friends after school. On weekends, house activities including trips to the coast, the football, to Melbourne, the theatre or laser tag are arranged. Other times boarders will arrange their own activities within their house or with friends. Find out more! Tours can be arranged at a time and day that suits your family. Open Days are held each term and include an opportunity to meet our Principal and teaching staff, and to experience our school, classes and activities guided by students. Visit www.geelongcollege.vic.edu.au or phone (03) 5226 3156 to arrange a tour.